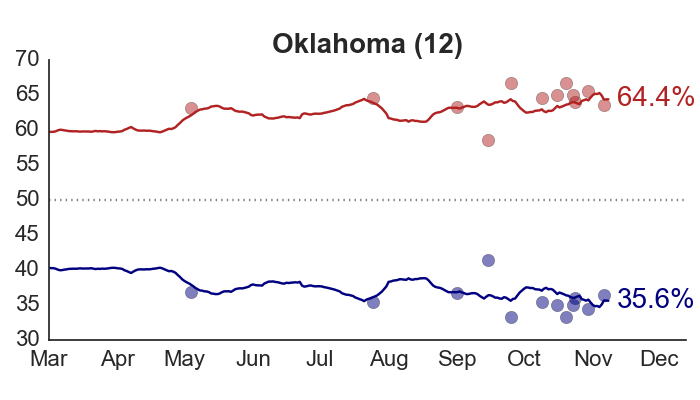 There’s a general consensus among poll-watchers that Obama is currently ahead in most – if not all – of the battleground states. 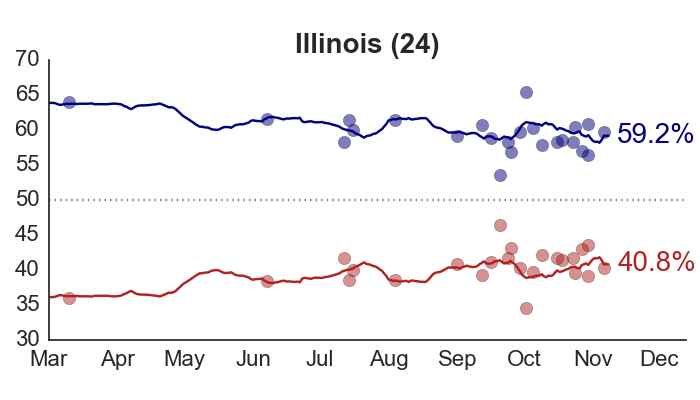 How likely is this lead to hold up through Election Day? And what range of outcomes are realistic to expect? 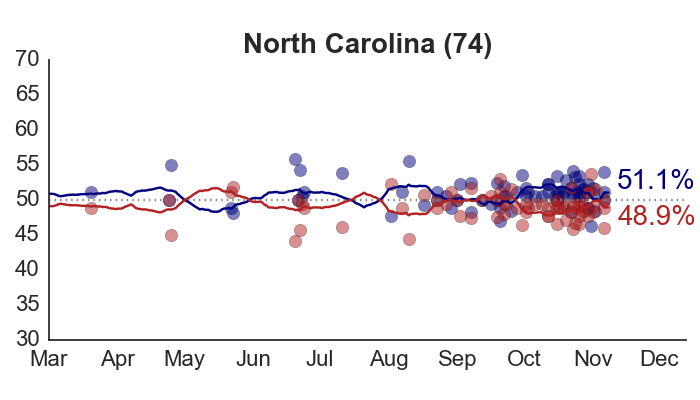 Let’s set aside the forecasts being produced by my model (which combine the polls with certain assumptions about long-term election fundamentals), and instead just walk through a few different scenarios starting from where preferences stand today. 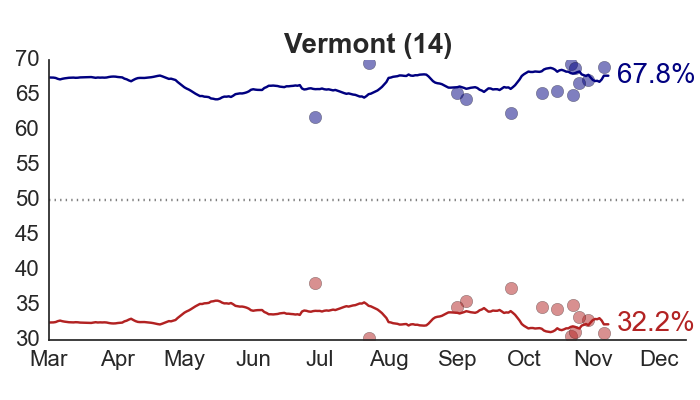 I start by accounting for uncertainty in the current level of support for Obama and Romney in each state. 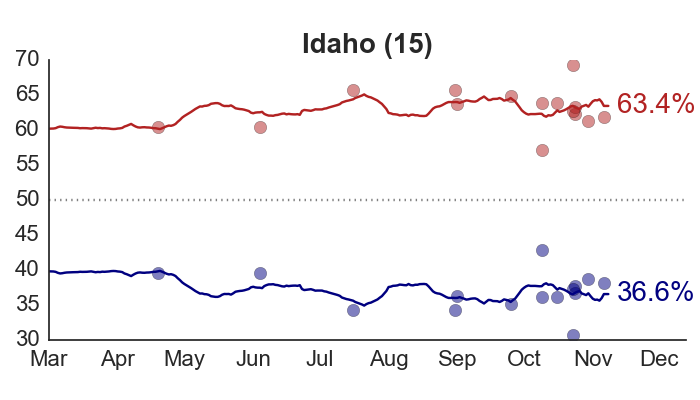 The idea is simply that we have better estimates of public opinion in states that have been polled more frequently. 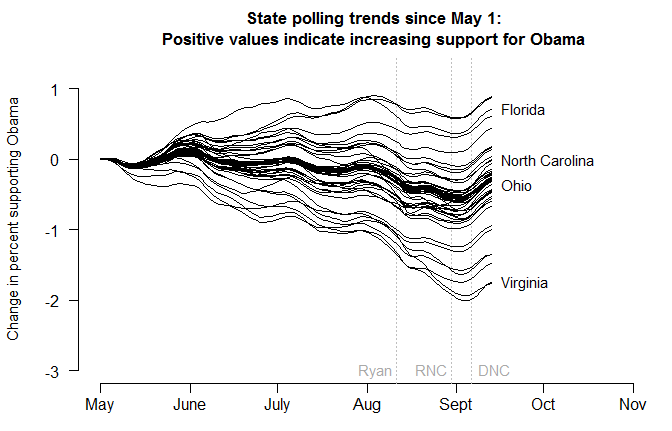 From the model results, I simulate 10,000 plausible “states of the race” for all 50 states. 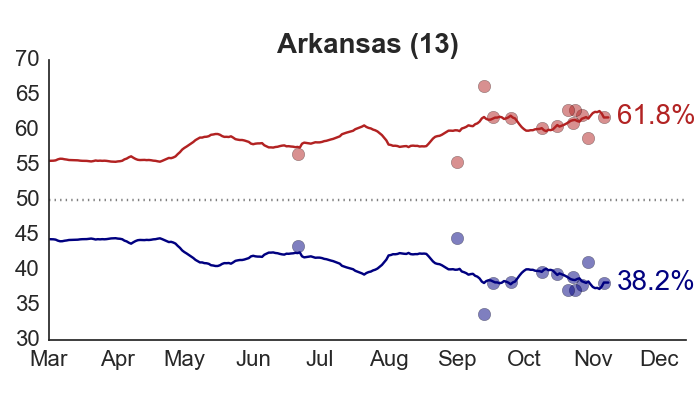 Next, we have to make some guesses about how voter preferences might change between now and Election Day. 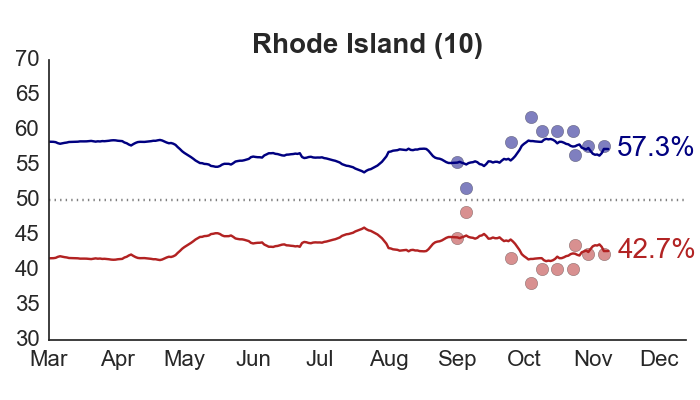 So far, state-level opinion has been fairly stable; only varying within a 1%-2.5% range. 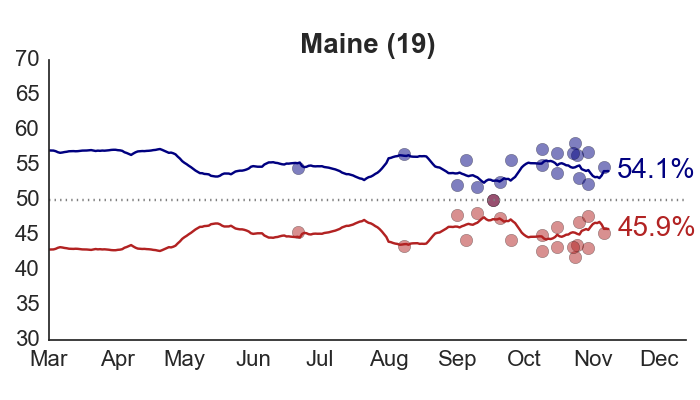 Since Obama is ahead right now, the less we believe preferences are going to fluctuate over the next six weeks, the worse for Romney. 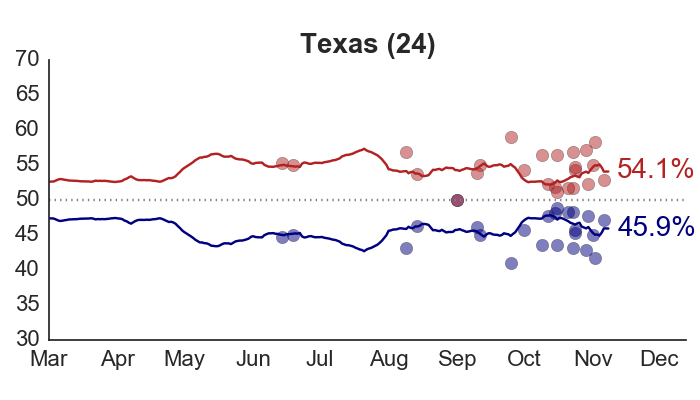 So let’s generously assume that with 95% probability, voters might swing as much as 4% in either direction from their current spot, with a modal change of zero. 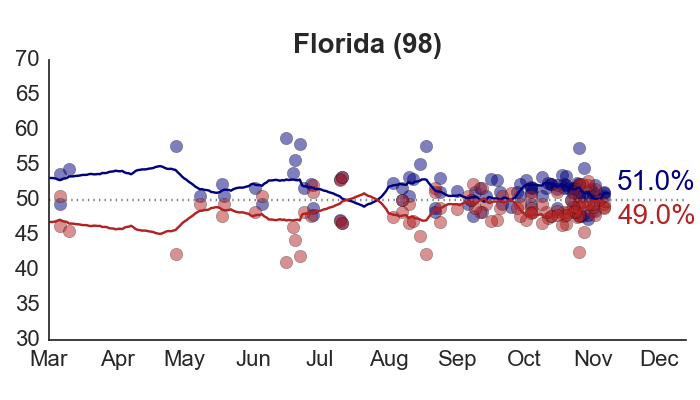 Here’s what the combination of these two assumptions would look like in Florida. (Recall all percentages exclude third-party candidates and undecideds.) There’s some initial variation around today’s estimate (the square); then the potential future changes are added in. 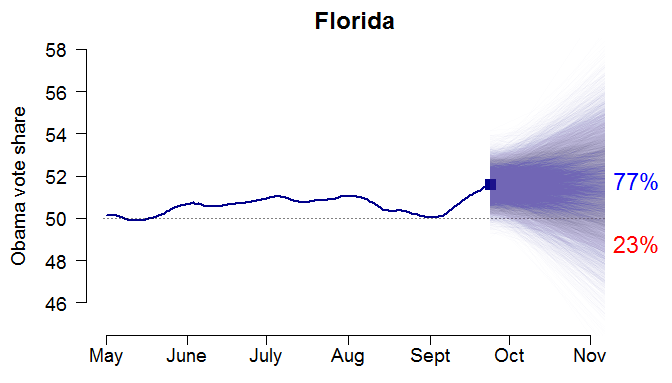 The result is a 77% chance of Obama winning Florida – that is, 77% of the 10,000 simulations result in an Obama two-party vote share above 50%. 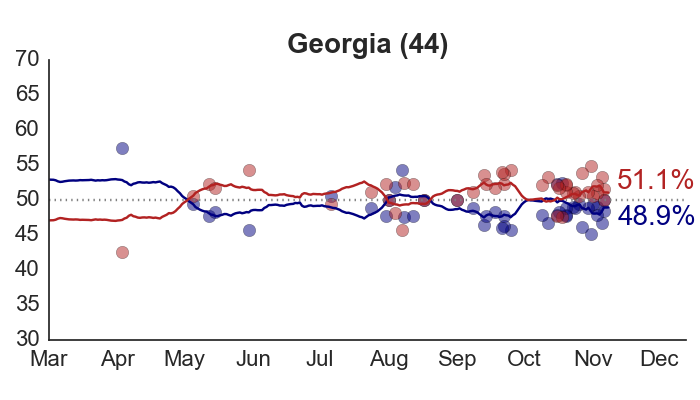 Finally, to extend the simulation to all 50 states, we have to consider that future changes in state opinion are not likely to be independent. 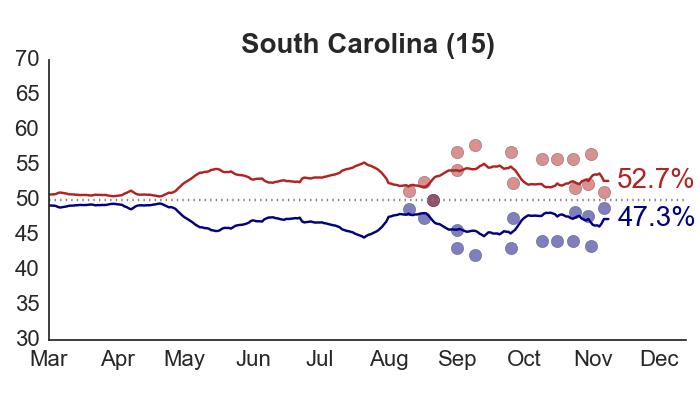 In other words, if Romney starts doing better in Florida, he’s probably going to improve in North Carolina, Virginia, Ohio, etc. as well. 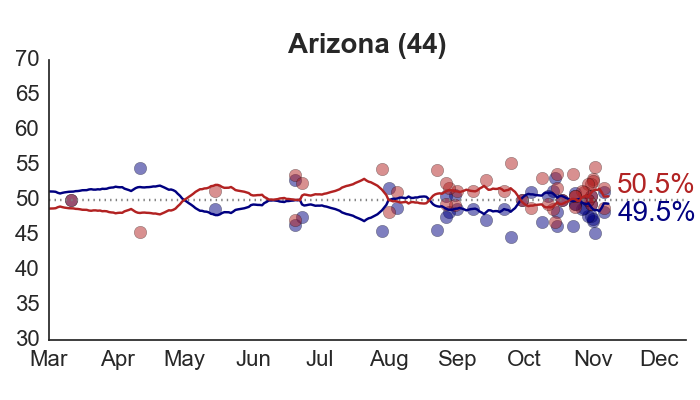 So we want to build in some correlation between the state trends. 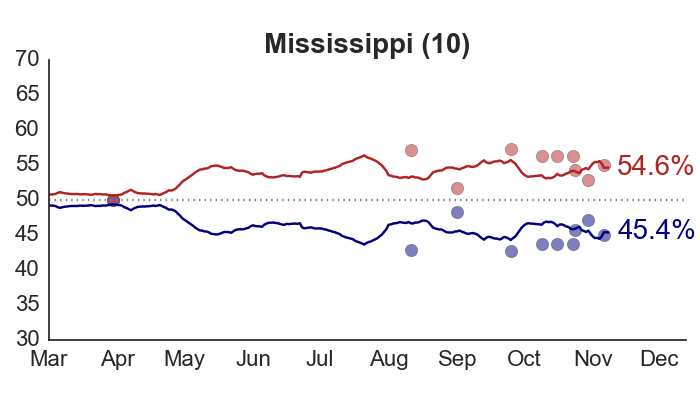 Perfect correlation would be equivalent to “uniform swing” in which a constant amount is added to (or subtracted from) each state’s current estimate. 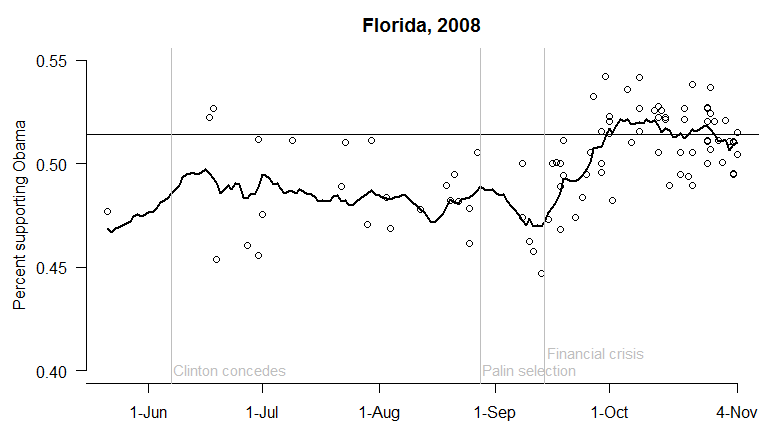 The lower the correlation, the more the future state trends differ from one another. 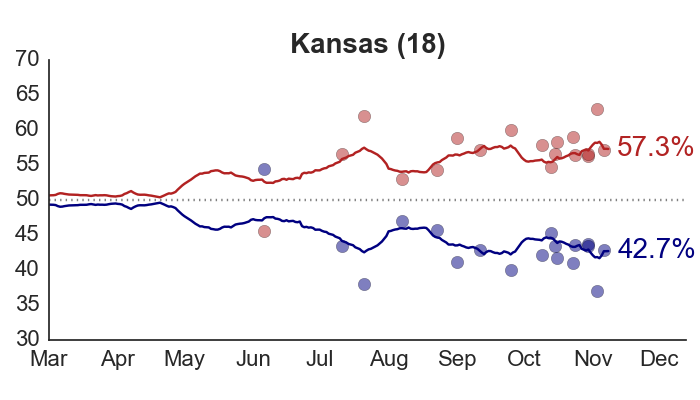 Let’s try a moderate level of inter-state correlation: 0.8 on the range from 0 to 1. I generate 10,000 hypothetical election outcomes in all 50 states, and add up the number of electoral votes Obama receives in each. 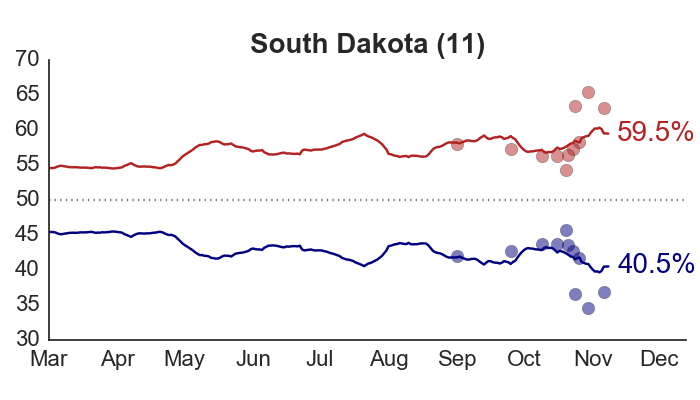 The result is a 92% chance of victory for Obama, with a median outcome of 347 electoral votes. 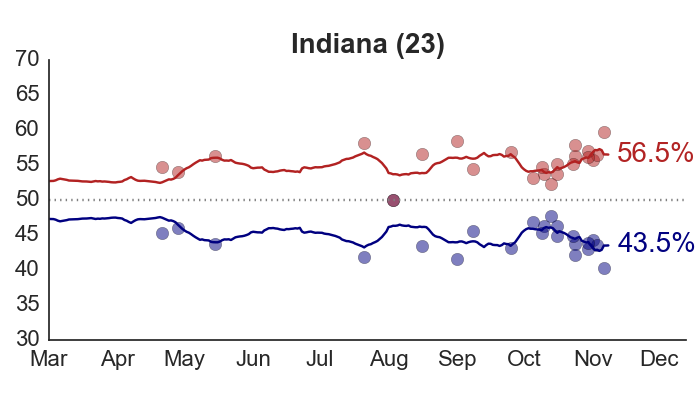 This would be Obama winning all of his 2008 states, except for Indiana. 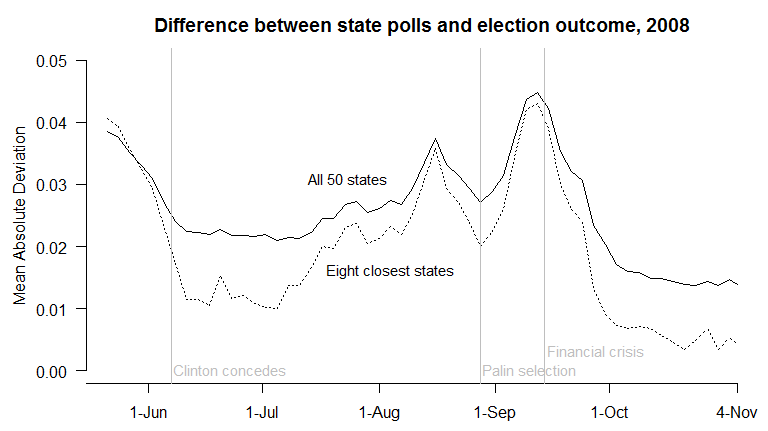 If we increase the correlation between states all the way to 1, Romney’s chances of winning are still just 10%. What’s going on? 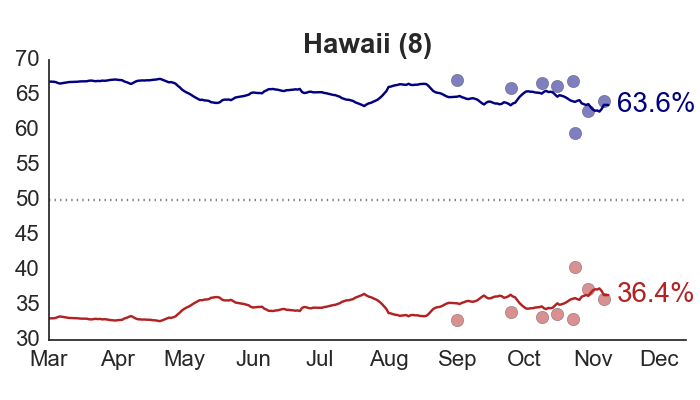 Obama’s lead in the polls is so large right now, that he could lose 2.5% of the vote in every single state and still have enough support to clear 270 electoral votes. 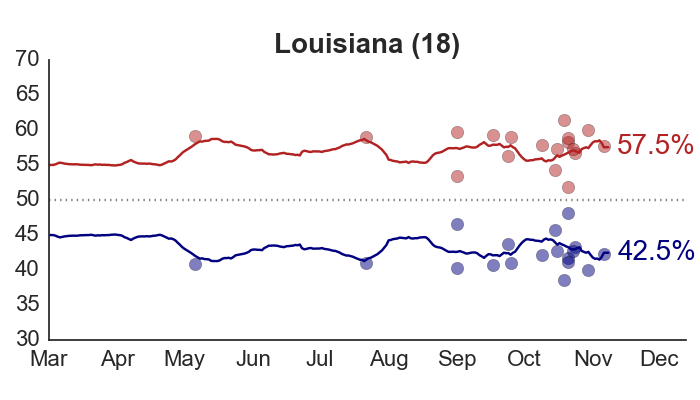 The chances of him slipping more than that, if current trends continue, are slim. 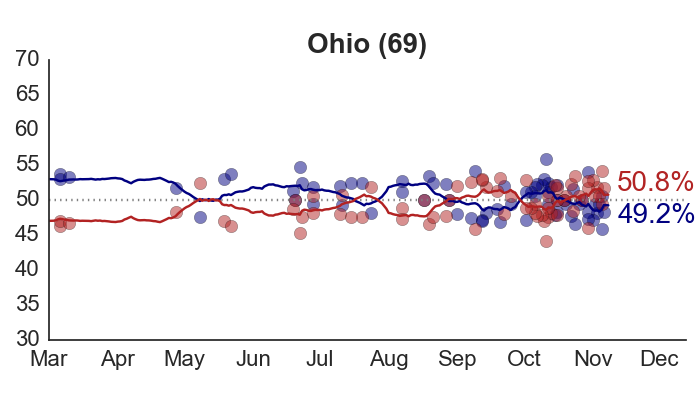 One possibility is that the polls are all biased in Obama’s favor, and have been systematically overstating his level of support. 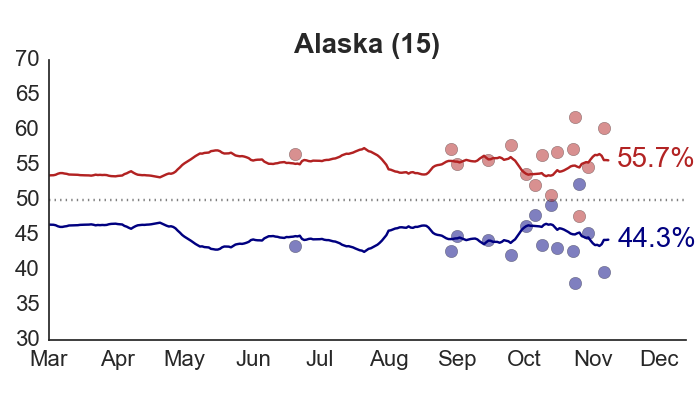 Suppose we knock 1% off the model’s current estimates in each state and re-run the simulation, assuming perfect uniform swing. 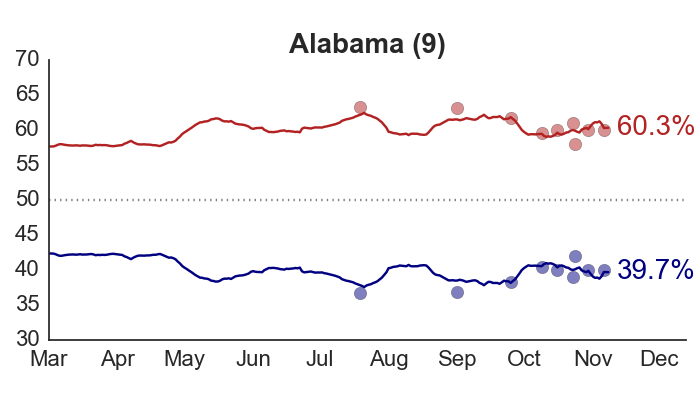 In that case, Romney’s chances improve to 20%. 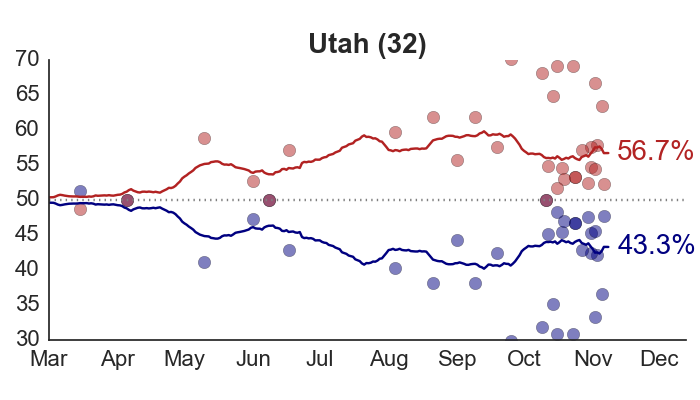 If the polls are all biased 2% in Obama’s favor, the simulation moves Romney up to a 37% chance of winning – still not great, but at least better than 8%. 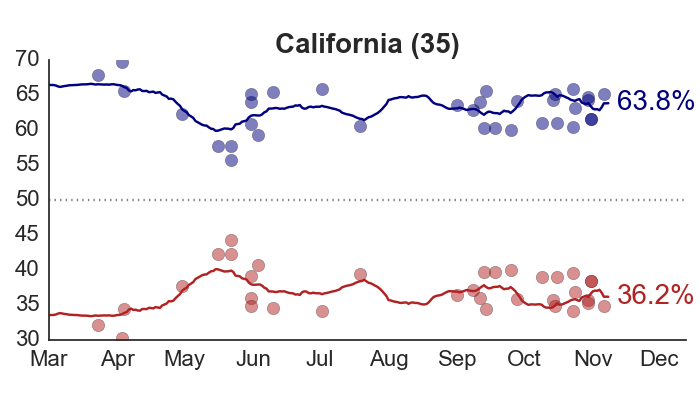 No wonder the Republicans are starting to challenge the polls. 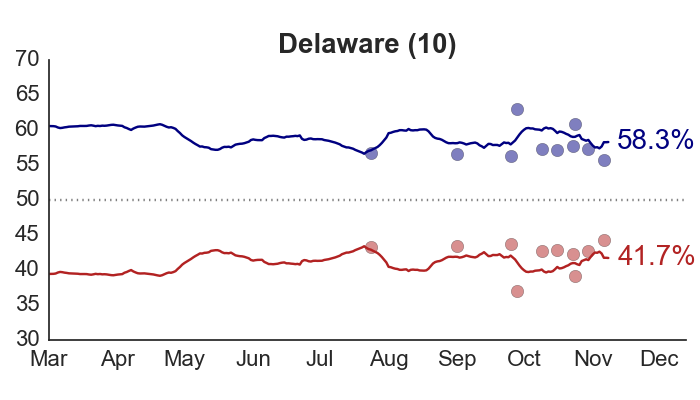 Unfortunately, there’s no serious indication that the polls are behaving strangely this year. 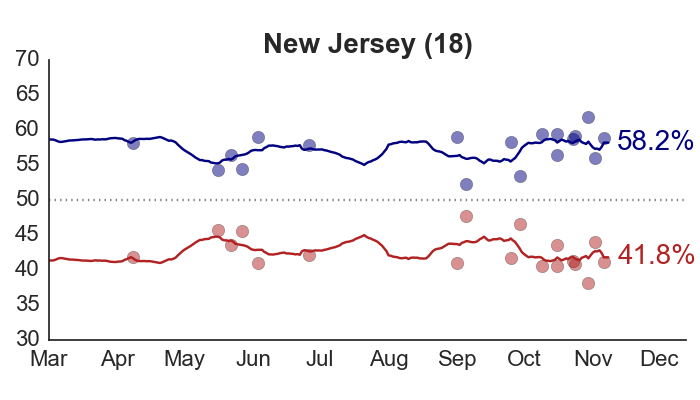 With the pace of polling increasing, there are going to be days when some polls seem to be especially surprising – or even contradictory. 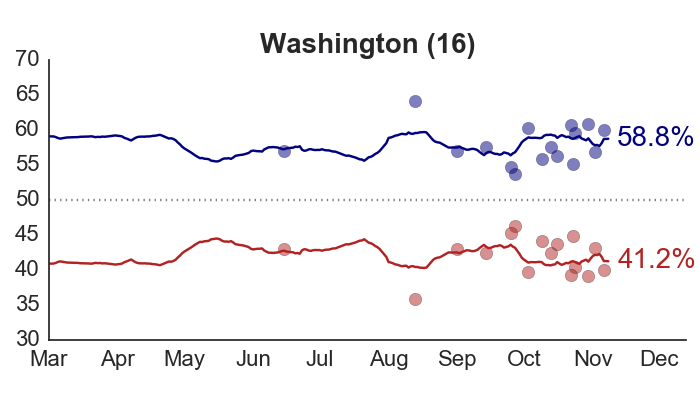 For example, a recent Washington Post survey found Obama up 8 points in Virginia, even though other polls indicate a tighter race. 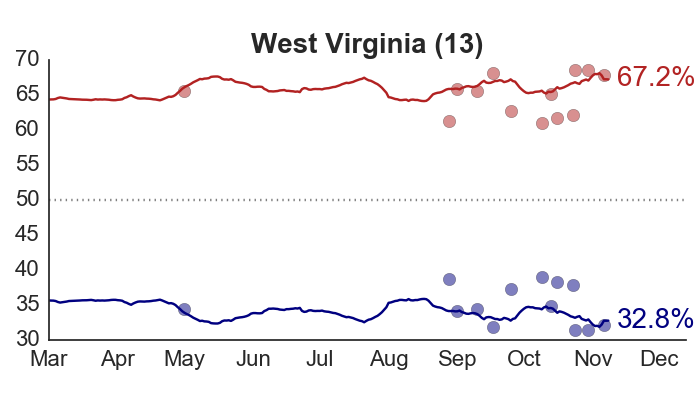 It’s pretty safe to say that Obama is not actually winning Virginia by 8 points. 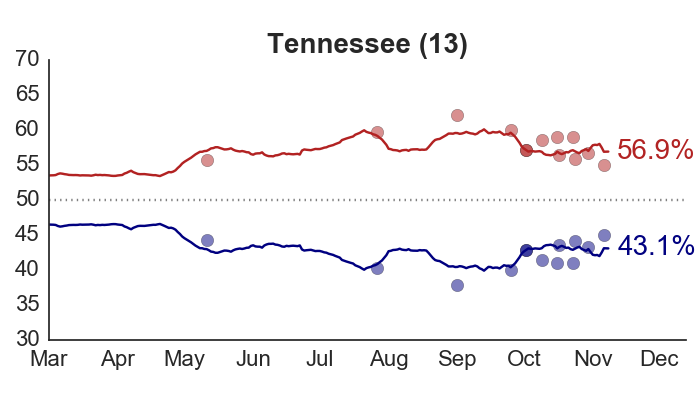 But this doesn’t mean the Post poll is biased, or wrong, or should be ignored. I imagine the Post did the best job they could. 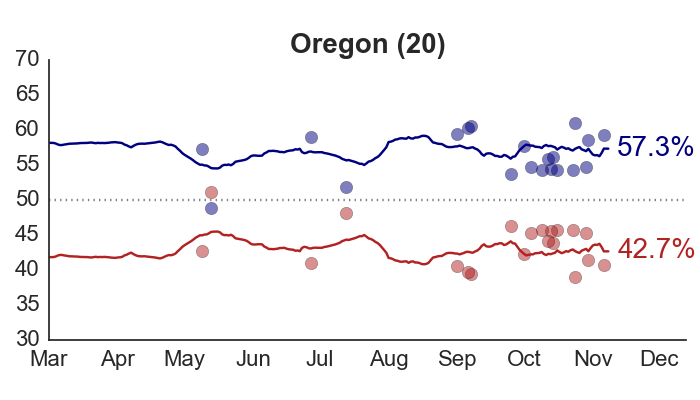 The likeliest explanation for the finding is simply random sampling error. Even in a perfectly executed survey, there’s going to be error due to random sampling. A survey only contacts a small group of respondents, and those people won’t always be representative of the broader population. 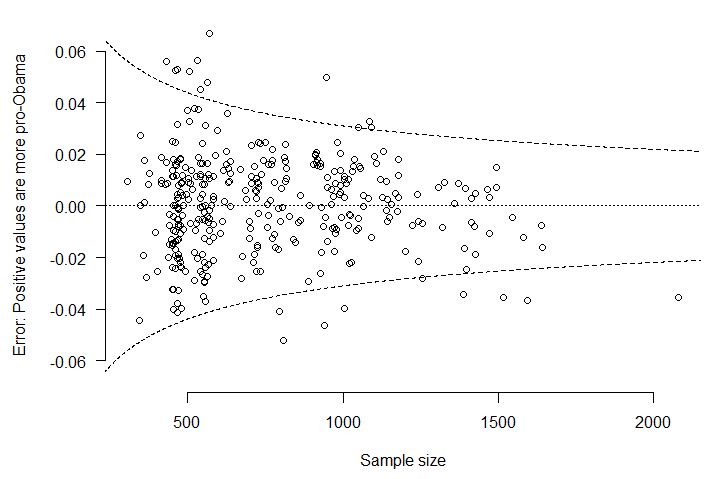 The smaller the sample, the larger the sample-to-sample variability. 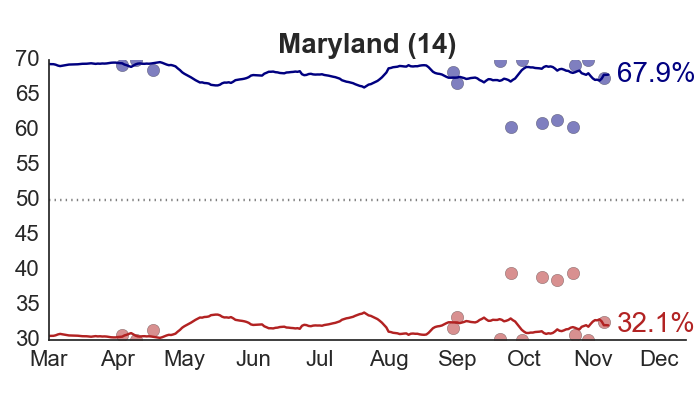 To see just how large sampling error can be, suppose my model is correct that Obama is currently preferred by 52% of decided, major-party voters in Virginia. 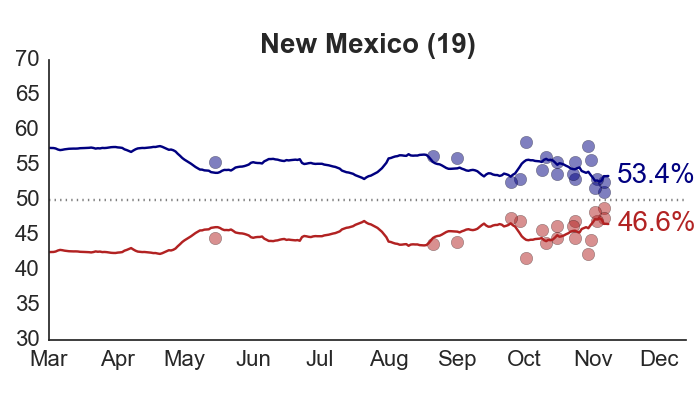 Then in different surveys of 750 respondents (which is about the average size of the state polls), it wouldn’t be unusual to see results ranging anywhere from 48% to 56%, because of sampling variation alone. 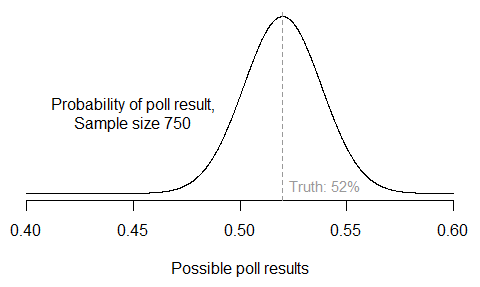 In fact, here’s the expected distribution of all poll results under this scenario: most should be right around 52%, but many won’t. If we added in other possible sources of survey error (question wording, interviewer effects, mode effects, sample selection, and so forth), the distribution would become even wider. 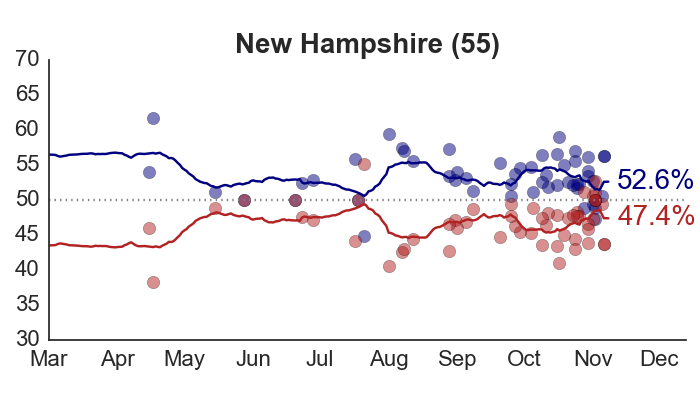 So just imagine two polls on the same day showing Romney with either 52% or 60% of the two-party vote. Astounding, right? No, not really. 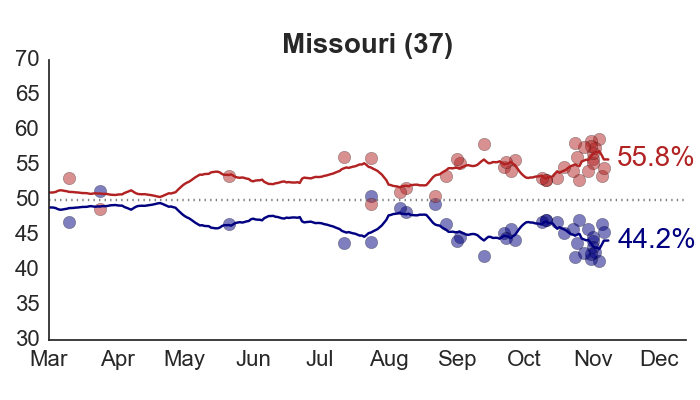 It happened in Missouri last week. 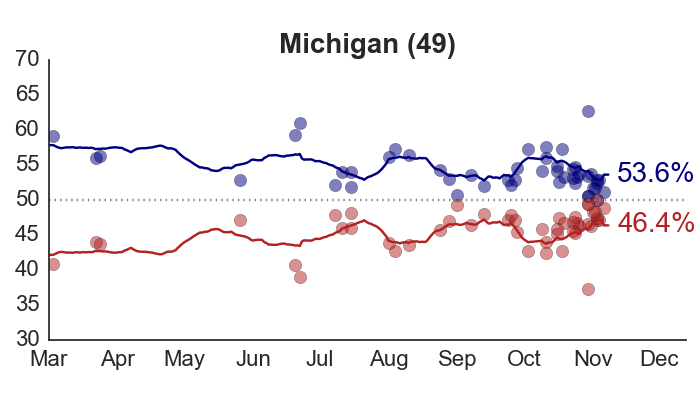 What is actually astounding about the polls this year is how well they are behaving, compared to theoretical expectations. 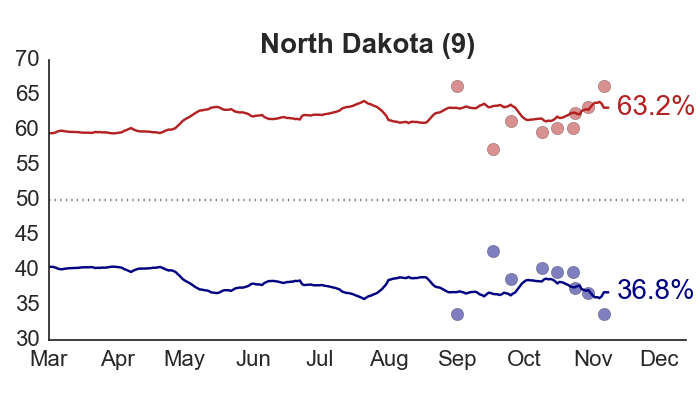 For a given sample size, the margin of error tells us how many polls should fall within a certain range of the true population value. 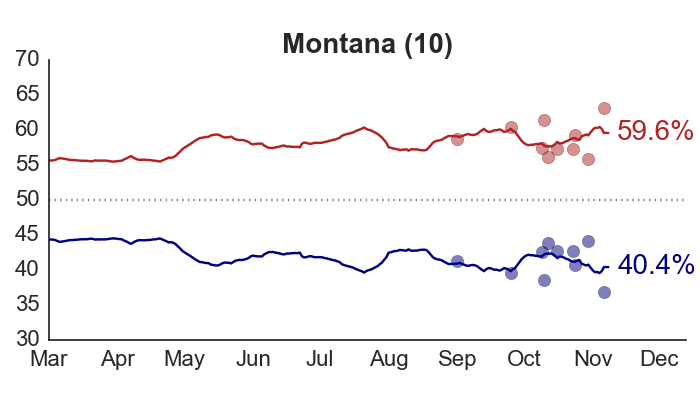 I’ll assume my model is correctly estimating the current level of preference for Obama over Romney in each state during the campaign. 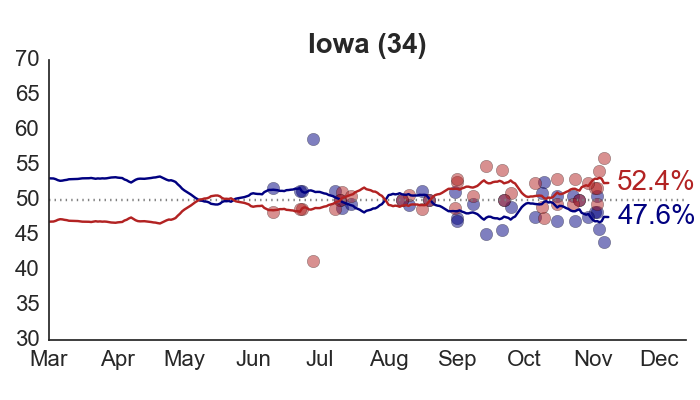 Then I can subtract from each observed poll result the model estimate on that day. This is the survey error. 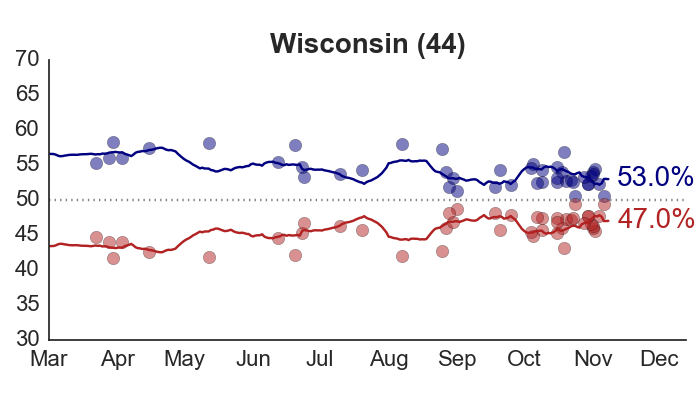 It turns out that most polls have been exactly where they should be – within two or three points of the model estimates. 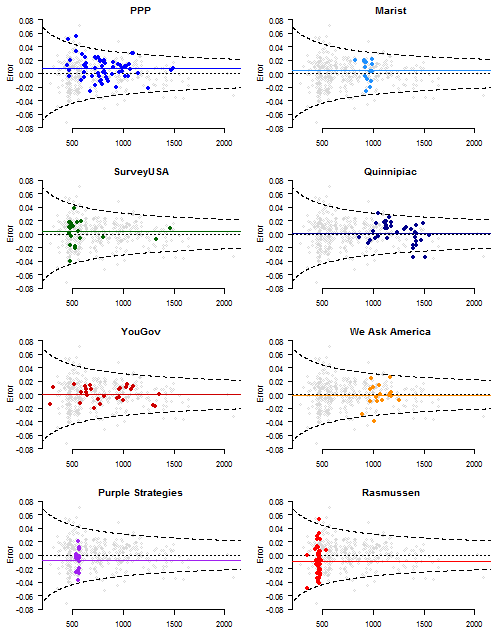 And that’s without any correction in my model for “house effects,” or systematic biases in the results of particular polling organizations. 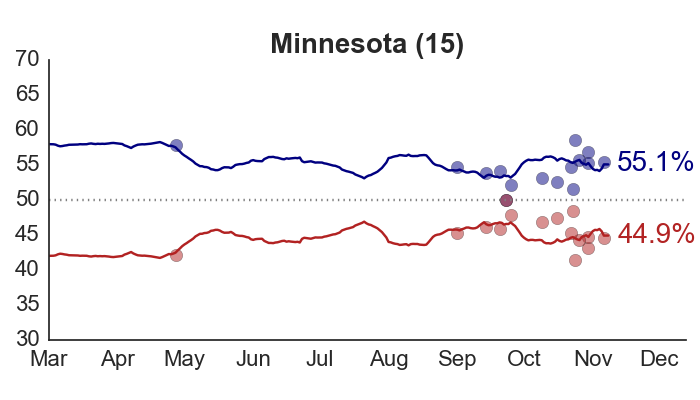 Plotting each poll’s error versus its sample size (excluding undecideds) produces the following graph. 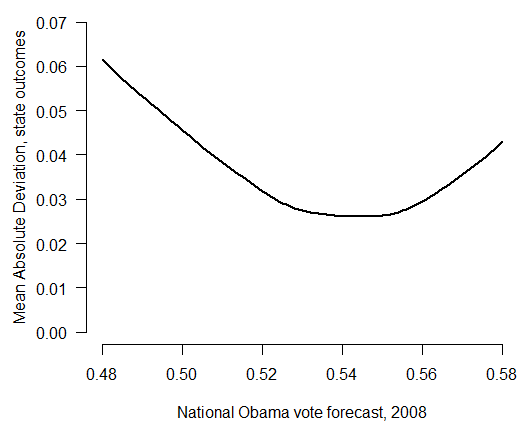 The dashed lines correspond to a theoretical 95% margin of error at each sample size, assuming that error arises only from random sampling. 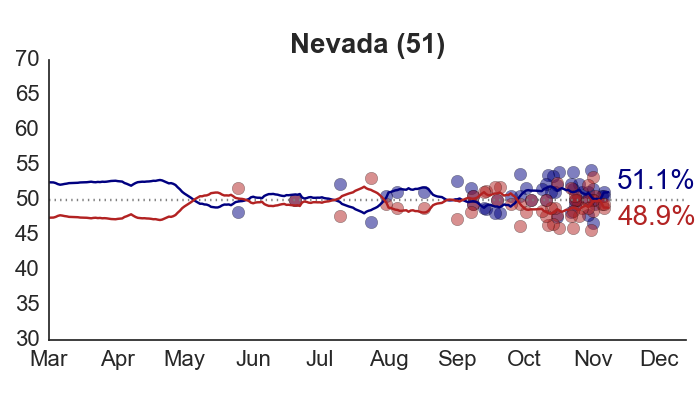 If the model is fitting properly, and if there are no other sources of error in the polls, then 95% of polls should fall within the dashed lines. The observed proportion is 94%. 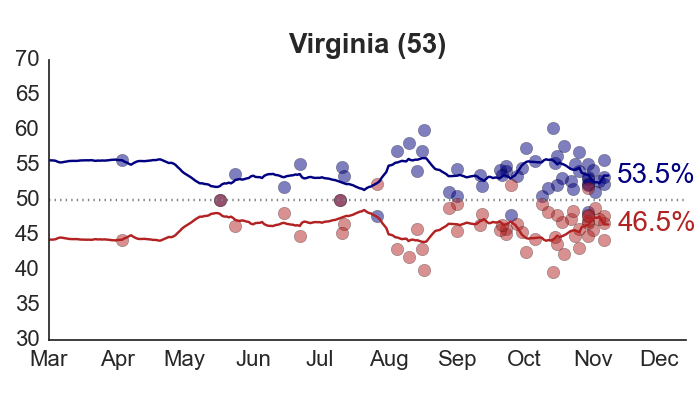 Certainly some polls are especially misleading – the worst outlier, in the lower right corner, is the large 9/9 Gravis Marketing poll that had Romney ahead in Virginia (and was singly responsible for the brief downward blip in the Virginia forecast last week). 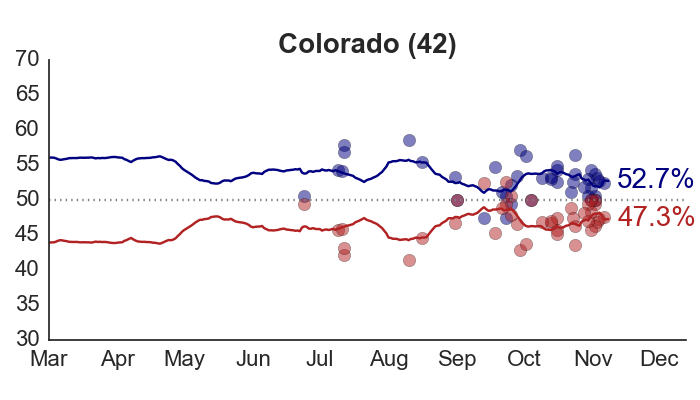 But what is most important – and what helps us trust the pollsters as well as their polls – is that the overall distribution of survey errors is very close to what we would expect if pollsters were conducting their surveys in a careful and consistent way.